Why are more churches closing than opening? What are the causes? Some churches die and it’s not the end of the world. Churches are born, they live, they might even thrive, but in time, they might finally close their doors through no fault of their own. One such example would be when our small town in Arkansas (when I lived there) closed their local factory. The jobs were the only reason the town existed, so when the jobs were shipped overseas, the people left to find work and the town dwindled next to nothing. Consequently, the two small churches in that town had no choice but to close. 13 people in two churches would prove the end because they couldn’t pool enough support between them to keep their doors open. They thought about joining together, but after two other families left, they settled for a house church because the next church was over 41 miles away and the winding roads of Arkansas makes that about a 1 1/2 hour or 2 hour trip, and if you’ve been in Arkansas, many of the roads are like roller coasters, so the two churches had to close, but through no fault of their own. This is the same cycle that nature follows; things are born, they live, and then they die. 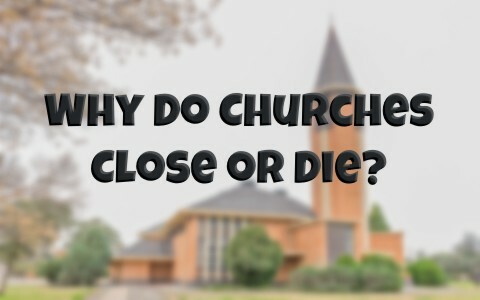 Not all churches die, but what are the reasons that churches close or start to die off, even in highly populated areas? We must preach the gospel, teach the gospel, and live the gospel. If the sheep in a church are not being fed, or if they’re being fed a “health, wealth, and prosperity” gospel, they’ll starve to death. Sermons today are more like cotton candy. They taste really good, but there’s nothing substantial in them; they don’t satisfy the appetite. When churches stop preaching verse by verse, expository preaching, they lose their greatest agent of change; the Word of God. If the Spirit of God is mixed with the Word of God then the children of God will grow, so this is why it’s important to worship God in spirit and truth. Those are the worshipers God is seeking (John 4:23). If worship is not done in both the spirit and truth, then God is not seeking their worship. If God’s not seeking their worship, and they’re in a local church, then that church will not grow. If they teach the truth, the truth can set them free…if there is no preaching straight from the Bible, then it’s a man-made mix of opinions, thoughts, and beliefs, and you can’t even hang your hat on that! Human teachings such as these are worthless compared to the power that is found in the gospel (Rom 1:16; 1st Cor 1:18). Jesus said, “whoever does the will of my Father in heaven is my brother and sister and mother” (Matt 12:50), and He gave one of the most frightening statements in all the Bible by saying, “Not everyone who says to me, ‘Lord, Lord,’ will enter the kingdom of heaven, but the one who does the will of my Father who is in heaven” (Matt 7:21). Despite claiming to do good things for Him (Matt 7:22), he says, “I never knew you; depart from me, you workers of lawlessness” (Matt 7:23). Even though this speaks about the individual, the applications for the church are enormous. If a church is not visiting the sick, those in prison, helping the poor, and making strangers feel welcome, then it is being disobedient to the Lord’s commands to do these very same things (Matt 25:35-36) because it’s the same as doing it unto Jesus (Matt 25:4), or doing nothing for Christ (Matt 25:41-43). Pure religion is not hard to figure out (James 1:27). It’s as easy as reading the Bible. A church that does not evangelize is a church that will soon fossilize, and serving others is being a doer of the Word, not just a hearer. If we don’t get the gospel right, we can’t expect the church to grow. One missionary, who was questioned just before he left for a mission trip, and fresh out of seminary, was asked, “What is the gospel?” The missionary was at a loss for words and showed he was not yet ready to be a missionary, because the missionary must know the gospel inside and out. He must be able to show God’s wrath against all unrepentant sinners, and that only the blood of the Lamb of God can make them holy in God’s sight. They cannot stand before a Holy God otherwise. No man can! Churches must get the gospel right too, and that may be why the missionary didn’t fully understand how to present the gospel. His seminary failed him too on this most essential truth. The Apostle Paul said, “if you confess with your mouth that Jesus is Lord and believe in your heart that God raised him from the dead, you will be saved” (Rom 9:9). It’s too simple to get wrong, isn’t it, yet many twist Scripture and focus on the believer instead of focusing on the Word of God, which glorifies God, and that is the chief purpose of mankind. This Sunday, 71 churches will close their doors; that’s about 3,700 a year . That’s considerably more than the number of churches that open every Sunday or every year. It’s almost a warning shot to all churches today; stay biblical, preach the pure gospel (Rom 10:9-13; Acts 4:12), and be doing and not just hearing what Christ commanded (Matt 25:35-36). In instructing Timothy, Paul writes, “Therefore do not be ashamed of the testimony about our Lord, nor of me his prisoner, but share in suffering for the gospel by the power of God, who saved us and called us to a holy calling, not because of our works but because of his own purpose and grace, which he gave us in Christ Jesus before the ages began, and which now has been manifested through the appearing of our Savior Christ Jesus, who abolished death and brought life and immortality to light through the gospel” (2nd Tim 1:8-10). Please read that again, because that is the gospel. We must preach it, teach it, and live it. Read this article on a similar topic: What Causes Churches to Split? Previous post: Whatever Happened To Nicodemus And Joseph Of Arimathea?